An unaged mild cheese. Some restaurants use it in the French Canadian favorite, Poutine (French fries and curd topped with gravy). 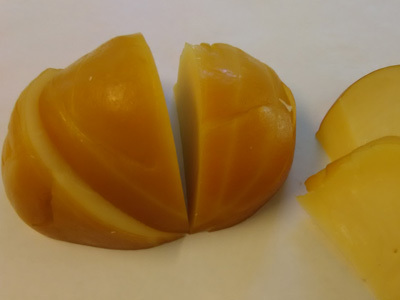 Very popular with children, Cheddar Curd is great for snacking as is. It melts well in Macaroni and Cheese or on pizza. It is delicious heated on crusty bread, or tossed with pasta and marinara sauce or diced tomatoes. Available in 8oz and 4lb containers. 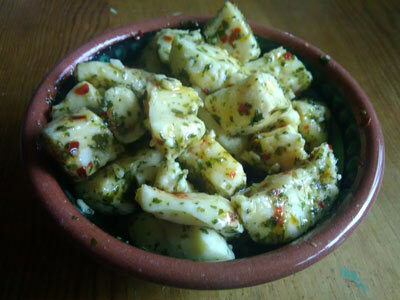 Fresh Cheddar Curd marinated in extra virgin olive oil with dried parsley, red pepper flakes and garlic. A spicy appetizer with rustic bread, and great on pizza. 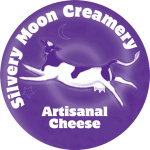 This cheese won a first place ribbon at the American Cheese Society’s cheese competition in 2007 and a bronze medal at the 2018 Big E. Available in 8oz and 4lb containers. Fresh Cheddar Curd marinated in extra virgin olive oil with dried chives, parsley, basil, tarragon, rosemary, and marjoram. A delicious appetizer with baguette, and a nice addition to pasta. This cheese won a second place ribbon at the American Cheese Society’s cheese competition in 2004. Available in 8oz and 4lb containers. You won’t believe how good cream cheese can be until you try ours. Creamy and tangy. No stabilizers or fillers added. Available in 8oz containers (5lb containers available upon request). We offer seasonal flavors like Garlic Chives or Lemon Dill (summer), and Pumpkin Spice (October – November). Available in 8oz containers. 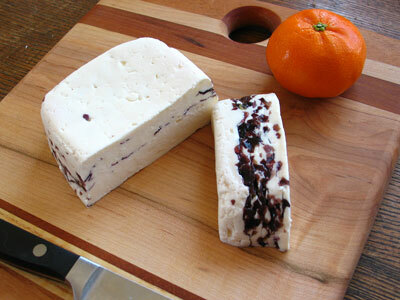 A fresh cheese with layers of dulse, adding a sweet, sea-salty twist to the tangy cheese. This red seaweed is harvested on the coast of Maine by VitaminSea Seaweed (Buxton, Maine). It is packed with important nutrients like protein, minerals and vitamins. 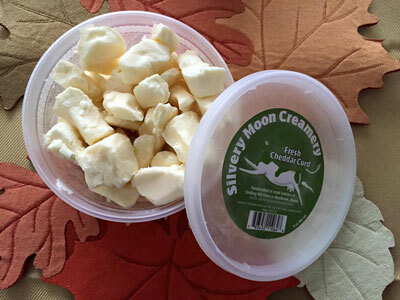 A beautiful addition to any cheese plate, appetizer, or salad. Available in 6 to 9oz squares (2.5lb wheels available upon request). This slightly tart cheese is coated with rosemary and a scattering of juniper berries for a fragrant twist on a fresh cow’s milk cheese. It can be sliced on bread or crackers, added to roasted root vegetables, crumbled over salad, or be part of a cheese plate. 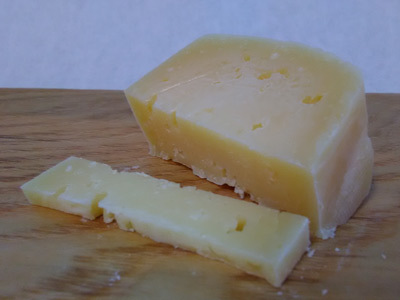 Rosemary’s Waltz won a second place ribbon at the American Cheese Society’s cheese competition in 2004. Available in 2.5lb wheels and 6 to 9oz wedges. Another fresh cheese that invites your senses to dance. It features layers of dried cranberries. 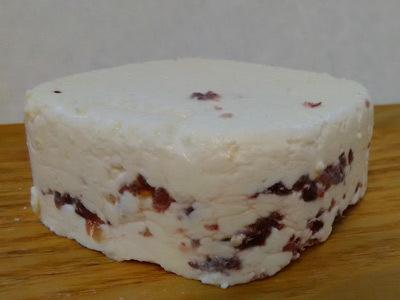 The cranberries lend a sweet and tart note that complements the fresh tang of the cheese. It pairs great with mead. Available in 6 to 9oz squares (2.5lb wheels available upon request). 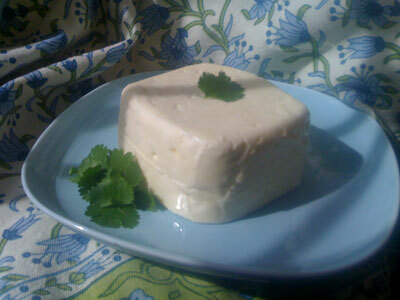 A Mexican style fresh cheese, whose name translates to “Summer Cheese”. Its lemony tang and delicate flavor allow you to enjoy the essence of summer all year round, on the porch or in front of the wood stove. You can use this cheese like a Queso Fresco or Feta. Grate it over tacos and burritos, add it to sautéed spinach or roasted root vegetables, crumble over kale salad, or eat it with bread or crackers. Try grilling it for a few seconds on each side for a vegetarian barbeque option. Available in 6 to 9oz squares (2.5lb wheels available upon request). 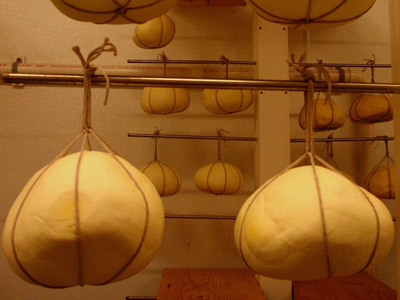 We hand stretch this cultured, pasta filata style cheese into a long ribbon and roll it up like a ball of yarn. It can be pulled apart like string cheese, and it melts like Mozzarella. Use this cheese in your favorite Mexican dish, in a lasagna or pizza recipe, in Insalata Caprese, or just as a snack. Available in 8 to 16oz balls. 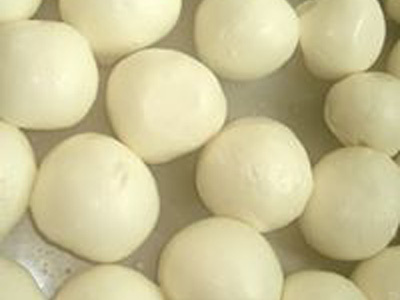 Occasionally, we stretch Mozzarella balls, to mix it up a bit. Mozzarella starts out as the same cultured curd as Queso Oaxaca. But then the melted curds are hand stretched and shaped into a ball. 10 to 16oz; smaller sizes available if desired. Inspired by their namesake French cousins, these cheeses have a creamy, buttery interior and a bold flavor. Like traditional bloomy rind cheeses, they will continue to ripen as they age even under refrigeration, getting stronger in flavor. Splendid as a table cheese with baguette and fruit, and a great addition to any cheese plate. 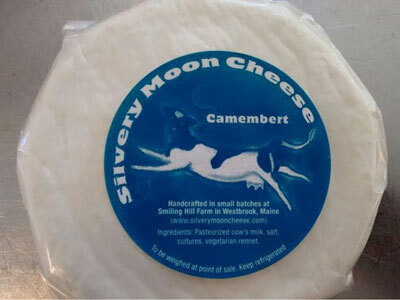 Camembert wheels are 7 to 9oz. Truncated pyramid shape with an unripened center (like Petit Coeur), covered in vegetable ash. 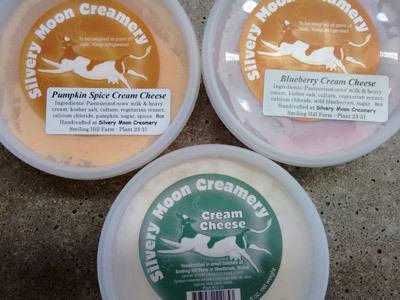 Named in honor of the Knight family, owners of Smiling Hill Farm and Silvery Moon Creamery. Beautiful addition to a cheese plate, paired with fresh fruit, toasted nuts, and honey. 6 to 8oz. 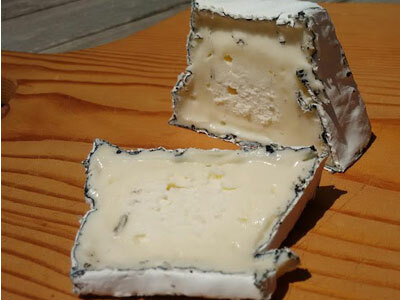 Splendid as a table cheese with baguette and fruit, and a great addition to any cheese plate. 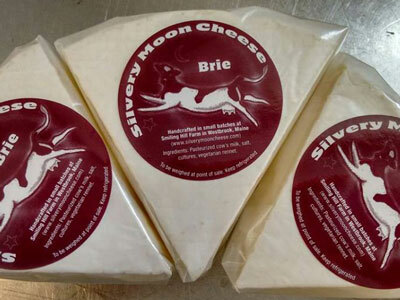 Brie wheels are approximately 2 to 2.5lb, Brie wedges are 5 to 7oz. Truncated pyramid shape. 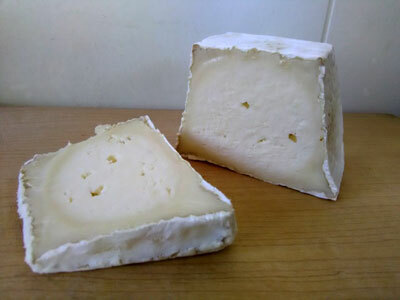 Underneath its white rind, a creamy interior surrounds a firm, curdy center. 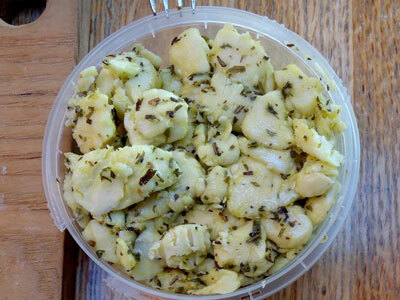 Flavor is intense, earthy and grassy, with a subtle tang. Great addition to a cheese plate, paired with fresh fruit, toasted nuts, and honey. 6 to 8oz. Hand sculpted and hung to age for one month. Smooth in texture, this cheese starts off sweet and finishes with a mild sharpness. Excellent slicing cheese. 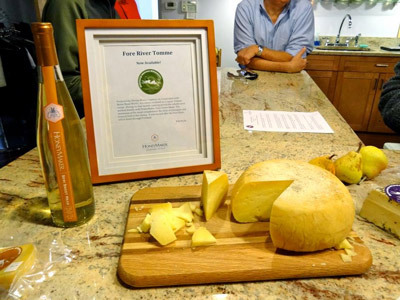 This cheese won a second place ribbon at the American Cheese Society’s cheese competition in 2013. Available in 4 to 6oz wedges and 2.5 to 3lb balls. We cold smoke our Provolone balls over local apple wood. Available in 4 to 6 oz wedges and 2.5 to 3lb balls. Limited production. 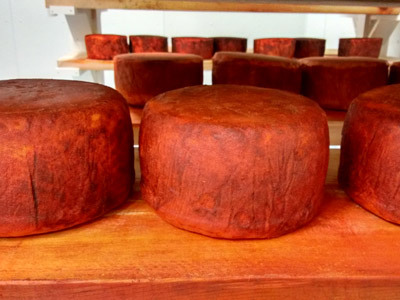 During their three month aging period, we wash these wheels of Tomme several times a week with Brother Adam’s Honey Ale (from the Atlantic Brewing Co. in Bar Harbor, Maine). The cheese is named after the Atlantic Brewing Co.’s location on Mount Desert Island. Available in 4 to 4.5lb wheels and 5 to 7oz wedges. Our take on a classic Tomme cheese. We age this cheese for at least three months. Hints of pineapple and tropical fruit make this Tomme and our other Tommes great additions to any cheese plate, served with fresh bread and fruit or preserves. Named after the river that runs near Smiling Hill Farm. Available in 4 to 4.5lb wheels and 5 to 7oz wedges. 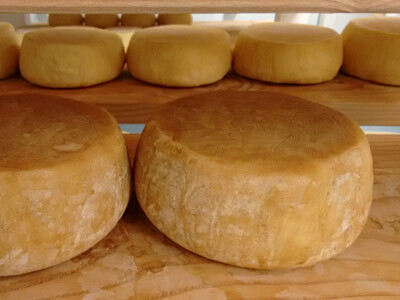 During their three month aging period, we wash these Tomme wheels several times a week with HoneyMaker Semi-Sweet Mead (from Maine Mead Works in Portland, Maine). We named this cheese after the river that runs through Portland. Available in 4 to 4.5lb wheels and 5 to 7oz wedges. This manchego style cheese is made with cows’ milk, and aged for at least four months. Buttery, nutty undertones perfectly complement the creamy texture. Wheels are rubbed with a paste of olive oil and smoked paprika. The cheese is a beautiful addition to any cheese plate, and delicious paired with quince preserves or figs. Available in 4.5 to 5lb wheels and 4 to 6oz wedges. Our cream-on-top yogurt is thick and creamy. We use probiotic cultures to ripen our milk, creating a flavor balance between tangy and smooth. Available in 16oz and 64oz containers. 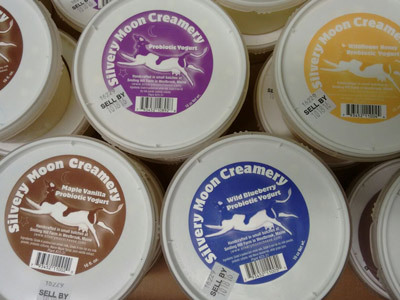 Our flavored yogurts only contain natural sweeteners, no processed white sugar, and always feature Maine ingredients. We have available Honey (harvested from local bees), Wild Blueberry, and Maple Vanilla. Available in 16oz containers. 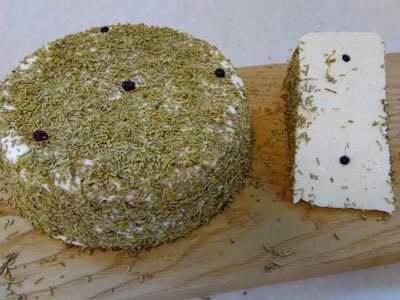 You can order our cheese wholesale. Our cheese is delivered by Smiling Hill Farm to places close to the farm. If your place is farther away, we ship cheese via FedEx in insulated boxes. Alternatively, you can pick up your cheese order at the Smiling Hill Farm store, which is open daily. We also work with distributors Native Maine Produce & Specialty Foods, Maine Family Farms, Dole & Bailey. For more information on prices, availability, and delivery or shipping options, please contact us.